There is no doubt that I am a different looking kind of dog. 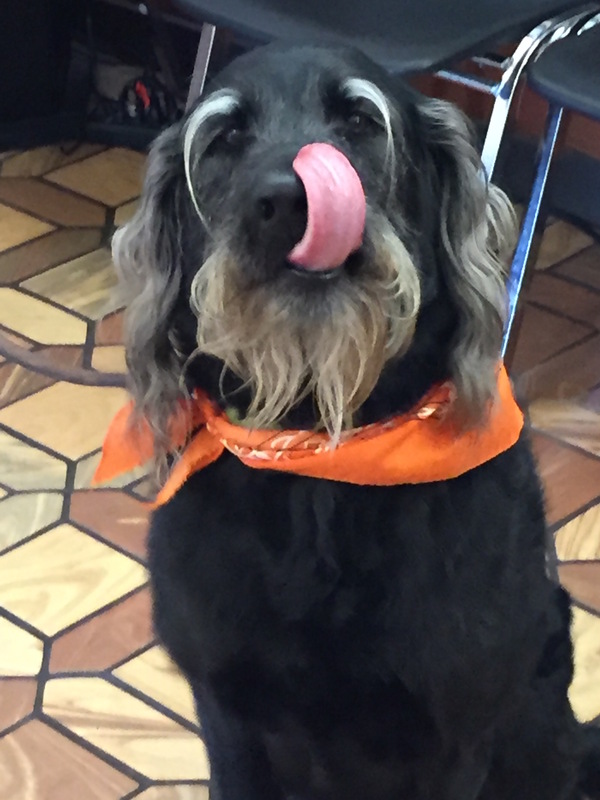 With my bushy eyebrows, beard and long curls hanging from my floppy ears, I get many second looks from the humans I encounter. Some question Doc about my breed and age as they try to pigeon-hole me into a category they understand. 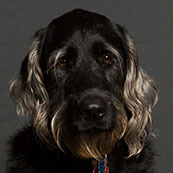 Most humans are complimentary and say nice things about me, but there are others that tell Doc that I am the ugliest dog they have ever seen. They assume that because I’m a dog that I don’t understand or sense the negativity in their voices. Sometimes it hurts my feelings, but Doc reminds me not to let other people’s negative opinions get to me, because that is all that they are, opinions. Because of those encounters, I have become more sensitive when I hear humans make judgments about each other. From my experience, human beings can get pretty ugly with each other in a multitude of ways. The worst things I see show up on social media. I guess people feel safe saying whatever they think when they are anonymous. They would never say those same things to someone face to face, or at least I hope not. It’s different for dogs. We strike out physically when we’re afraid. It’s a way to protect ourselves and those that we love. It’s pure survival instinct to deal with the situation and then move on. I have never lashed out or snubbed another dog because I looked down on them for being a mutt or having a past as a shelter dog where they were given food and housing for free. It makes me wonder where all the judgement comes from. I guess you humans are afraid of what you don’t know and protect yourselves by assigning a label or a judgement instead. The beauty of being a therapy dog, is that I get to love people unconditionally every day. I don’t care where you came from, what you did in the past, how much money you make or who you voted for in the last presidential election. There is a real sense of freedom that comes with that approach. Doc told me that many years ago a very wise professor she had in college told her that labels belong on cans not on people. I think that was a very profound thing to say. Maybe we would all be better off if we tried to get to know each other before coming to any conclusions. It must be crowed in a house that you have to share with 30 Pugs. A dog owner in Cheshire, England started out with one lonely Pug and ten years later is not the proud owner of 30. 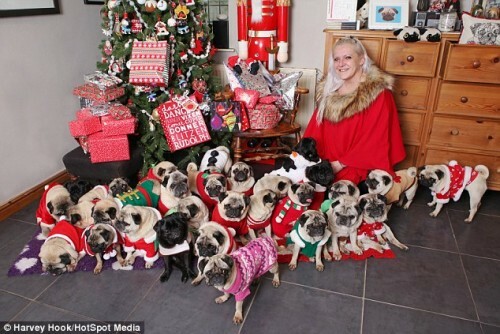 Is she a Pug hoarder you ask? Well, you be the judge. She originally got the first dog from her parents.Within ten years she had added 29 more through rescue organizations or breeders. After some time, she had to quit her job to take care of all of her dogs. Her parents now support her financially. In total, it costs her $24,000 per year for food, treats, grooming, toys, clothing and vet bills. This past Christmas she spent $1,200 for their presents. To tell you the truth, it would horrify me if Doc brought home 29 more dogs to live in our house. It gives me anxiety just to think about it. I am use to being an only child and going about my business without being bothered. Now don’t get me wrong, I wouldn’t mind having one more dog in the house to hang out with, but 29 more? Even I know that is a recipe for trouble. Dogs having a pecking order within the pack and it would be exhausting trying to figure out who was the boss on any particular day. Well, faithful readers, I would love to hear what you think about this, so either write me in the comment section of the blog or comment on Facebook. I can’t wait to hear what you think. It’s the New Year and it’s time to see what burning questions you have on your mind. So lets check the mail bag! Remember, if you have questions for me, I am always here to help, so drop me a line. Since my last girlfriend, a cute Sheltie dumped me for a German Shepard with a bigger dog house, I have been lonely. Being dumped hurt my ego and I am having problems meeting new dogs. Since you are famous, I thought you could give me some good pick-up lines that have worked for you. I need a self-esteem booster and fast. Can you help me Grover? Do not despair. If that Sheltie left you just because she wanted to be with a dog with a bigger dog house, I say you are lucky she left. What a shallow Sheltie. Gordon my boy, you don’t need some cheesy pick up line, you just need to be yourself. Then ask yourself, how you want to be treated by the next dog that makes your tail wag? Think about that and before you know it, you will be giving off the right scent and I guarantee you will have your pick of the litter. Well, the holidays are over and it’s the dead of winter in the Midwest. I would be lying if I didn’t admit that I kind of have the blues. After all the hustle and bustle from Thanksgiving through New Years with relatives coming and going, suddenly everything has stopped cold. So what’s a blog-writing dog to do to get out of my winter funk? 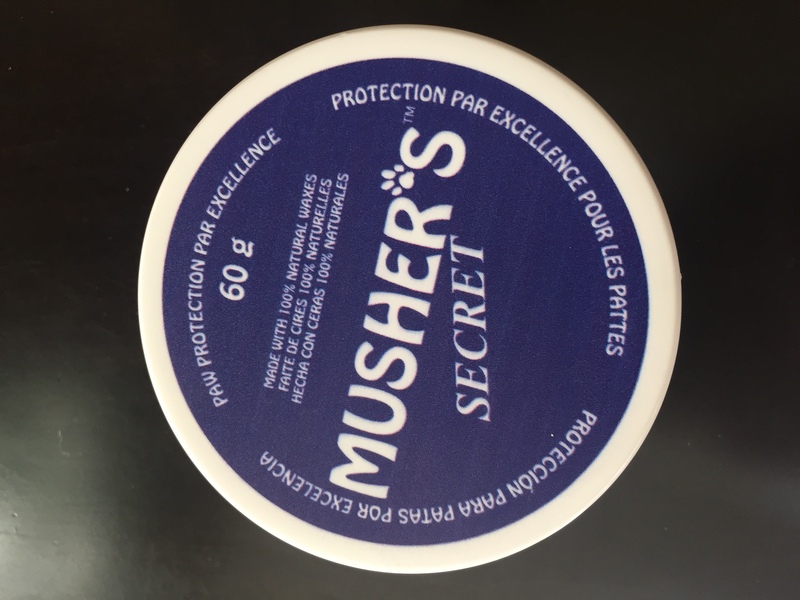 Just when I thought I would be stuck in the doldrums, I remembered that my friend and co-worker, Carol had given me a paw conditioner for Christmas called Musher’s Secret. Made with 100% natural waxes, I could imagine my paws becoming more subtle just thinking about it. There was just one problem, I would have to convince Doc to rub it on my paws. Doc was sitting on the family room sofa engrossed in a novel when I approached her to ask if she would be interested in joining me for a relaxing spa treatment. Her face brightened and she looked mildly interested at first. As I explained that she would need to massage the cream into all four of my paws, she scrunched up her face and then glared at me in the eyes like an evil witch. ” Grover this sounds like another one of your schemes that you benefit from and I do all the work, how is that going to be relaxing for me?” I tried to explain that we would be bonding and that being with me would reduce her stress. “No way, she said, I think you should ask your friend Carol to massage your paws since she gave you the stuff.” Gee whiz, what a grouch. There was only one choice left, so I sent Carol a text message. Thanking her for the lovely Christmas gift, I asked her if she would like to come over and bond with me by rubbing Musher’s Secret on my paws. So far I haven’t gotten a response.